Our pilgrimage to Israel in early June was a great experience. You’ll find below a series of journal entries from the journey converted for use as short Sunday morning reflections. Maybe it’s something in the desert air. Or all the rocks. Or maybe, just maybe, some important things actually happened here. Abraham, Moses, David, Jesus, and even Mohammed settled in this place or passed this way. Their followers have too, claiming this land as sacred and as their own. People are still coming today – Jew and Gentile, Christian and Muslim, people from every corner of the globe, representing every tongue and every nation, warriors and pacifists, rich and poor, liberal and conservative, adults and children, male and female – for a glimpse of some rocks and a breath of the air. The place has inspired and still does. It isn’t easily explainable. They are just rocks and air after all. Is it the result of East meeting West in a collision of cultures? Is it because of the dreams and vision(s) of the people who lived here? Did God choose this place and these people or did the people of this place choose God? In this you greatly rejoice, though now for a little while you may have had to suffer grief in all kinds of trials. 7 These have come so that your faith — of greater worth than gold, which perishes even though refined by fire — may be proved genuine and may result in praise, glory and honor when Jesus Christ is revealed. 8 Though you have not seen him, you love him; and even though you do not see him now, you believe in him and are filled with an inexpressible and glorious joy, 9 for you are receiving the goal of your faith, the salvation of your souls. Today began with a 400 step climb out of Nazareth. I thought that was bad until the steep descent on a dusty path, full of loose gravel. I knew the blisters would come, but hoped they’d wait a day or two to appear. I wonder if Jesus ever got blisters. I wonder if he got headaches, like the one that threatened to slow me down all day. I know he sought lonely places, but I wonder if he ever got lonely, if he felt alone. As I walked through the outskirts of towns I passed through wheat fields and imagined Jesus and his men plucking their fill on the Sabbath and Ruth gleaning on Boaz’s land. I passed olive groves and wondered what Jesus was thinking as he made his way from Nazareth to Capernaum to continue his public ministry. I made my way through the Zippori forest, thinking about how dangerous pilgrimage has been through the ages and about the generosity of the good Samaritans along the way who have helped Christians on the way to their destinations. Pilgrims have always faced hardships and dangers: bandits to contend with and sickness to overcome, as well as hucksters waiting to take them for all they had if given the chance. Still, they made their journeys, hoping for blessings and a glimpse of the divine. Pilgrimage, literal or figurative, hasn’t been easy in the past and we shouldn’t expect it to be now. Not that it has to be intentionally difficult, but in the difficulties that will inevitably come, if the pilgrim will open himself, his weakness might be revealed, (if you open… your weakness…you might get blisters…) as might be the hand of God. The drawback to lunch at McDonald’s was that it was cool, making the heat feel more intense when we went back outside. 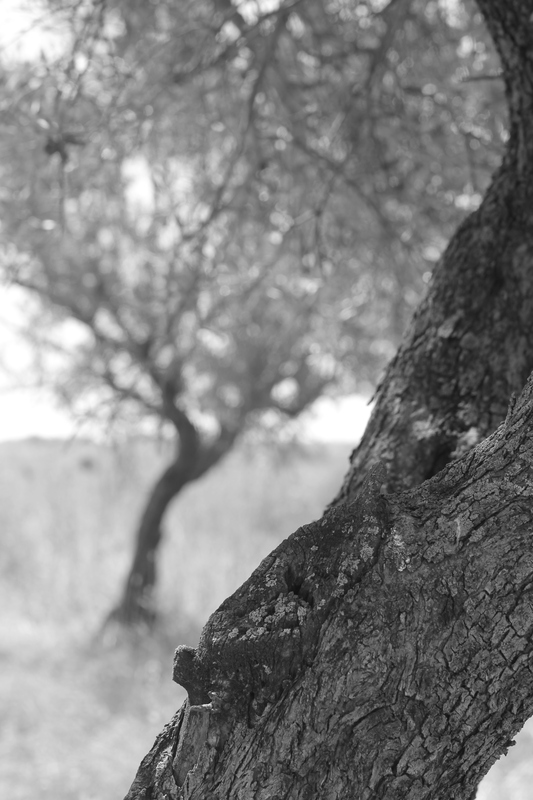 My journey took me through more fields and more olive groves and the long, winding way up a hill to the Kibbutz. My thoughts rambled today as I prayed for Tiffany and Vella and others. I pondered my own journey, wondering if hiking with blisters serves as some kind of penance. Maybe they’ll at least serve a purpose. There is no progress without blisters after all. Athletes train, scholars study, musicians rehearse. They do things to make themselves more excellent, refining their skills, honing their precision, training mind and body. It is much the same spiritually. We can seek excellence, that is closeness and faithfulness to Christ, or we can go through all life’s motions, scarcely considering the calling God has for each of us. But if we seek those opportunities to know God, if we receive those opportunities to walk closely with Christ, there will be some blisters, and there will be scars that remind us we are not as we should be, that we still have far to go, that we are still being refined for a greater purpose. But along the way we just might be encouraged by the prospect of the words “Well done good and faithful servant.” And so we press on, fighting the good fight, finishing the race, and keeping the faith, in spite of the blisters. Grace Saturday, June Something, Tiberias P.M.
23 When they hurled their insults at him, he did not retaliate; when he suffered, he made no threats. Instead, he entrusted himself to him who judges justly. 24 He himself bore our sins in his body on the tree, so that we might die to sins and live for righteousness; by his wounds you have been healed. 25 For you were like sheep going astray, but now you have returned to the Shepherd and Overseer of your souls. Limped on in to the finish line this afternoon with an aching back and aching knees and feet. Today’s wasn’t the hardest walk, but it was the most difficult. The fourth day in the sun, on gravely rocks, and up and down hills took its toll. Though the hike was all the way to Capernaum, the Church of the Fish and Loaves was my key destination. Capernaum is only a hop-skip-and-jump from the Church of the Fish and Loaves (or so I thought – it didn’t seem like it in reality). Arriving at the Church felt like the end of a glorious quest. I would like to say I saw visions and that great truths were illumined for me as a reward for my perseverance and dedication, but it was more about endurance than reward. Nonetheless, I was overwhelmed with gratitude as I inched my way to the monastery complex and into the church itself. Tired and weary, I had arrived in pain, wounded, and I realized we all arrive wounded. I sat on the floor in the church, off to the side and away from the crowds, rested, watched the other gawking tourists, and enjoyed the subtle but real presence of God’s comfort, the God who reminds us it is by his wounds that our wounds have been healed. A testimony to God’s grace available to us all.